Mish's Global Economic Trend Analysis: GDP by Other Measures; Will the "Real" GDP Please Stand Up? GDP by Other Measures; Will the "Real" GDP Please Stand Up? In the wake of a stronger than expected GDP report (see Second Quarter GDP Revised Up, as Expected, Led by Autos, Housing), some are questioning the stated growth. For example, the Consumer Metrics Institute says "On the surface this report shows solid economic growth for the US economy during the second quarter of 2015. Unfortunately, all of the usual caveats merit restatement". A significant portion of the "solid growth" in this headline number could be the result of understated BEA inflation data. Using deflators from the BLS results in a more modest 2.33% growth rate. And using deflators from the Billion Prices Project puts the growth rate even lower, at 1.28%. Per capita real GDP (the number we generally use to evaluate other economies) comes in at about 1.6% using BLS deflators and about 0.6% using the BPP deflators. Keep in mind that population growth alone (not brilliant central bank maneuvers) contributes a 0.72% positive bias to the headline number. Once again we wonder how much we should trust numbers that bounce all over the place from revision to revision. One might expect better from a huge (and expensive) bureaucracy operating in the 21st century. All that said, we have -- on the official record -- solid economic growth and 5.3% unemployment. What more could Ms. Yellen want? I certainly agree with point number three. Significant GDP revisions are the norm, even years after the fact. The numbers are of subjective use at best because GDP is an inherently flawed statistic in the first place. As I have commented before, government spending, no matter how useless or wasteful, adds to GDP by definition. Moreover, inflation statistics are questionable to say the least, as are hedonic price measurements and imputations. Imputations are a measure of assumed activity that does not really exist. For example, the BEA "imputes" the value of "free checking accounts" and ads that number to GDP. The BEA also makes the assumption that people who own their houses would otherwise rent them. To make up for the alleged lost income, the BEA actually assumes people rent their own houses from themselves, at some presumed lease rate. Imputed rent is an addition to GDP. Why stop there? On the same basis people who cut their own grass would have to pay someone else to do it for them. And married men might go to prostitutes if they were not married. And what about back scratching? You scratch mine and I scratch yours. Clearly there is unreported economic activity here. There are limitless imputations the government can concoct if GDP needs a future boost. By the way, Europe did recently revise up GDP on the grounds of unreported prostitution and illegal drug profits. Every month there are questions in regards to GDP deflators. rate even lower, at 1.28%. That's interesting, but is it valid? Although at first glance it may seem that CPI and GDP Deflator measure the same thing, there are a few key differences. The first is that GDP Deflator includes only domestic goods and not anything that is imported. This is different because the CPI includes anything bought by consumers including foreign goods. The second difference is that the GDP Deflator is a measure of the prices of all goods and services while the CPI is a measure of only goods bought by consumers. Difference Between further adds to the explanation. CPI tends to consider insignificant goods, even the outdated ones that are not really purchased by the consumers anymore. Nevertheless, they are still considered for pricing in the fixed basket. Consumption goods are the main priority of the CPI measure. The prices of other items used in production are not considered as well as the prices of investment goods. Only consumer items are taken into account. The machines and the industrial equipment that are used to make them are not considered. I am not going to suggest the GDP deflator is by any means correct. Indeed, I believe some prices are inherently difficult if not impossible to measure. But substituting the CPI as a more valid measure is as likely as not to be even more inaccurate. is 0.6%, Q2 is 3.7%, and the GDPNow estimate for Q3 is 1.4%. For 2015, through three quarters, we are talking about growth of about 1.6% or so. This is not rate hike material. Since point four above was obvious sarcasm targeted at Fed Chair Janet Yellen, I am in agreement with Consumer Metrics on this point. 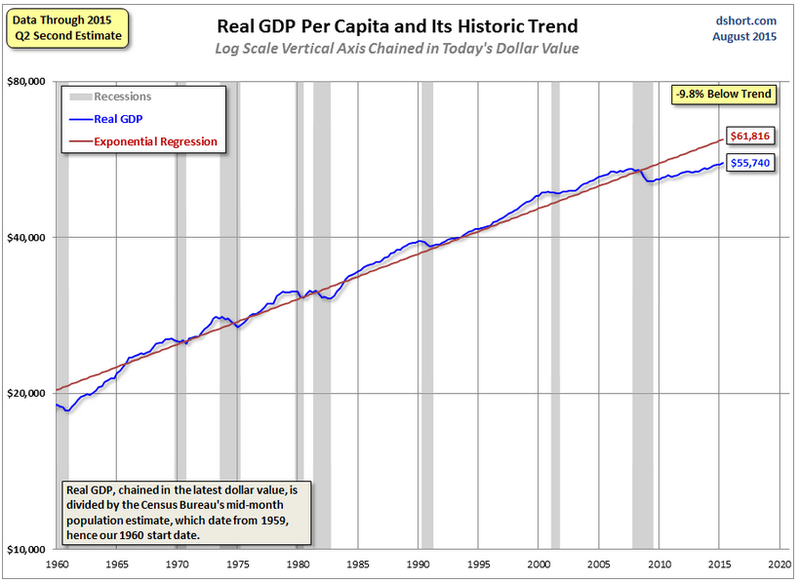 Finally, and in reference to point number two, real per capita GDP remains quite anemic. The above chart from Advisor Perspectives. 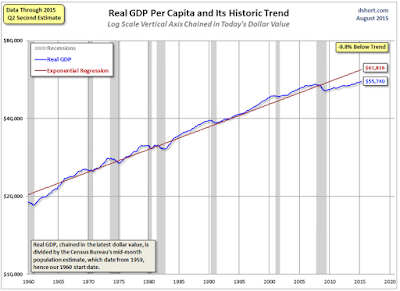 Per capita GDP reflects aging boomers, student debt, government debt, slow household formation, untenable pension promises, and extremely poor central bank and governmental policies that have effectively wiped out the middle class.